Windows network security is of primary importance due to the sheer volume of data residing on Windows networks. Windows 2012 Server Network Security provides network administrators with the most focused and in-depth coverage of Windows network security threats along with methods and techniques for securing important mission-critical networks and assets. The book also covers Windows 8. Provides practical examples of how to secure your Windows network. Focuses specifically on Windows network security rather than general concepts. 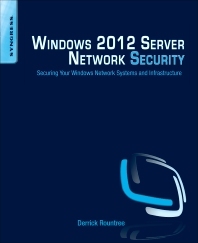 One of the first books to cover Windows Server 2012 network security. Information Security professionals, Windows systems administrators, and network administrators who use Windows products. Derrick Rountree (CISSP, CASP, MCSE) has been in the IT field for almost 20 years. He has a Bachelors of Science in Electrical Engineering. Derrick has held positions as a network administrator, IT consultant, a QA engineer, and an Enterprise Architect. He has experience in network security, operating system security, application security, and secure software development. Derrick has contributed to several other Syngress and Elsevier publications on Citrix, Microsoft, and Cisco technologies. (CISSP, CASP, MCSE) has been in the IT field for almost 20 years.